It’s that time of year again where we Canberrans begin to live in hope of a little warmth and sunshine. But don’t put away your winter woollies too quickly. Just when the weather feels like it has turned a corner and we can end our hibernation, the cold winds from the south return. Late August and September did bring us some beautiful days, enough to start dreaming of Summer holidays, visiting the beach and long country walks. Towards the end of August after a hectic bookish month, (see last months post), I escaped for a well earned rest to warmer skies. Perth already felt like Spring had sprung. I shared several glorious days with my eldest son and his wife. We explored the wonderful Swan Valley region with all its delicious offerings of wineries, chocolate factories and even a gin distillery. I discovered like Canberra, Perth too, has a tulip festival. 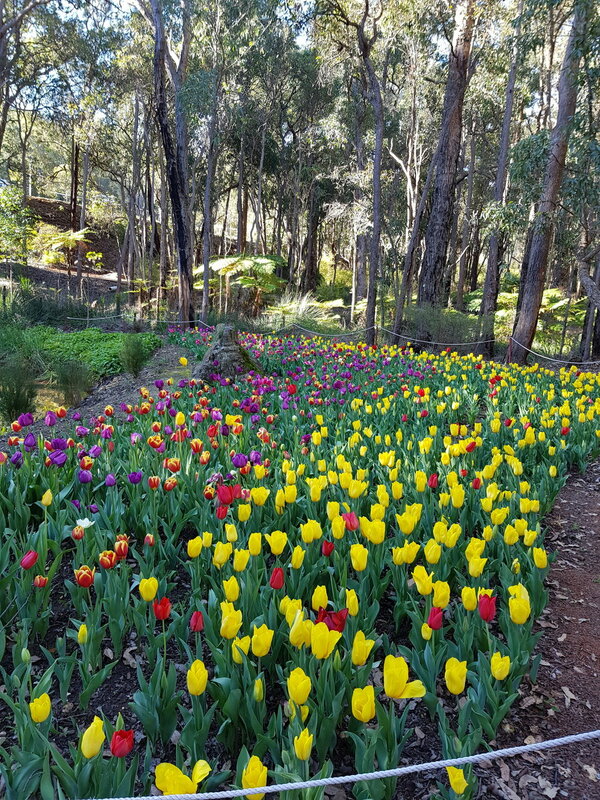 Their’s is set among the beautiful hills behind Perth in the Araluen Botanic Park. A hidden native garden I had no idea existed until this visit. We had planned to visit the gardens for the day anyway, when on arrival we found to our delight the tulip festival had begun. It was a perfect Spring day for meandering along garden paths under Eucalypt trees taking in the abundant colour. Naturally, as with all my trips to Perth, we also visited Kings Park Botanical Gardens. Many of the native wildflowers were just beginning to bloom, but I did take a few lovely shots of some of the Kangaroo Paw. Springtime in Canberra means tulips, wattles and cherry blossoms. Not to mention the inevitable hay fever that comes along with all the pollen. On one of my morning walks around our valley I did stop to take a few pics of the wattle. Its bright yellow blossoms always bring sunshine to any day. Back home in Canberra our own Floriade has begun in all its amazing glory. I have had the opportunity to walk around the festival twice already this year. It is wonderful to see all the families out and about enjoying the weather and all that Floriade has to offer. Including the tulips and pansies, Floriade also entertains with an annual painted garden gnome competition, ferris wheel rides and art & craft, and local produce stalls. I found my picture books ‘Emma the Eager Emu’ and ‘Frazzled Freya’, both being sold among the stalls and enjoying the sunshine, (thanks so much to Monica of Wombat Cards & Gifts). We even managed our first trip to the beach this month. Although the wind was still a tad chilly, it was fabulous to soak in the sun and watch our grandson experience the sand and surf for the first time. I did do one school visit, for a writer’s workshop with year 5 & 6 students, (and a book signing too, at Harry Hartog in Woden.) but that is the topic of another blog post. Maybe next time. With the Spring also came a bit of much needed rain. (We still need a lot more.) The paddocks have been looking very hard and dry and our water tanks have never been so low. On a positive note the rain brings the kangaroos out more to graze during the day. It is a chance to see all the cute new joeys as they begin to pop out of their mother’s pouches. We have also had deer grazing in our paddocks more frequently than ever before. I think they have discovered the green grass where our grey water waste flows. Deer are curious creatures and get up to rather a lot of mischief that includes eating the blossoms from my ornamental pear tree and pulling branches off my gum trees with their massive strong antlers. Spring is in the air and Summer is just around the corner. Time to start making plans for those lazy hazy days down the beach. That also includes a reading list for time spent in the shade of a tree, swinging in a hammock or lazing by a pool. Perhaps it’s time to plan your next Summer getaway? Don’t forget to include a book for the kids. ‘Secrets Hidden Below’ will take them to the beaches of Bali and beyond. Filled with adventure and surprises it just might inspire you and the kids to book that well deserved holiday. Have you ever been to a tulip festival? What are your plans for the upcoming warmer months? What is on your reading list? Newer PostWriting Workshops Are So Much Fun. 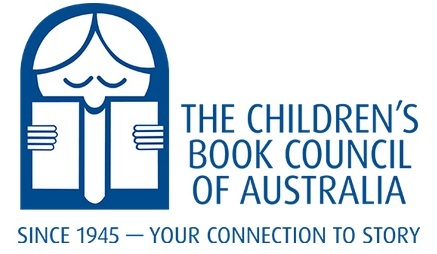 Older PostA Bookish Month, Engaging Book Launches & School Visits.